Dashiell Hammett’s 1930 detective novel The Maltese Falcon had already been adapted for the screen twice before John Huston’s version starring Humphrey Bogart. But it was the Huston film, originally released on October 3, 1941, that became a certified classic. The MacGuffin driving the film’s plot is a one-of-a-kind, life-sized statue of a bird. Memorably described by Bogart as “the stuff that dreams are made of,” the desirable trinket is revealed at the movie’s cruel climax to be a worthless lead fake. That hasn’t prevented the falcon from becoming one of the most prized props in movie history, right alongside the ruby slippers from The Wizard Of Oz. But what really happened to the statue from the movie, and is it truly one of a kind? Earlier this year, Bryan Burrough researched the topic for a Vanity Fair article entitled “The Mystery Of The Maltese Falcon.” The article is, by the author’s admission, “ambiguous,” but it does contain plenty of fascinating speculation and intrigue, including a possible tie to the Black Dahlia case. Officially, the genuine item was sold at auction in 2013 for over $4 million to casino billionaire Steve Wynn. This was the so-called “Milan falcon,” so named for its former owner, Beverly Hills oral surgeon Gary Milan. But Milan’s statue is made of lead and weighs 45 pounds, making it an impractical movie prop. Meanwhile, internet entrepreneur Hank Risan has a couple of lightweight plaster falcons that some film experts claim are authentic. Clouding the issue is the 1975 spoof The Black Bird. 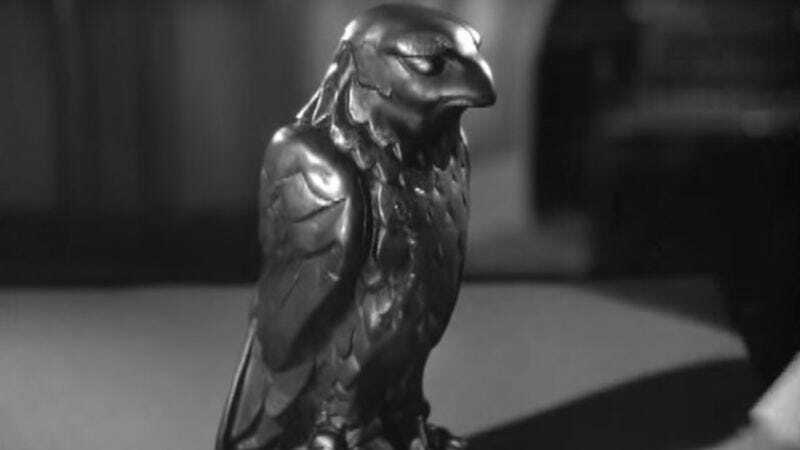 Many falcon statues were manufactured for this comedy, apparently from the 1941 mold. In his attempts to authenticate his falcons, Risan learned that the original statue had been molded by artist Fred Sexton, alleged by one author to be an accomplice in the gruesome Black Dahlia slaying. The authenticity of various Maltese falcons remains controversial after 75 years, and the article mentions some furtive firings and threats of lawsuits over the matter. But the film’s value has never been much in doubt. For the movie’s anniversary, The Hollywood Reporter dug up its own positive review from 1941. A sample: “On a number of accounts it is distinguished celluloid entertainment.” Good call.